Truth Surfer: Coleen Rowley Wins MN CD2 DFL Endorsement! A standing ovation, cheers, clapping, foot stomping and real smiles! Coleen Rowley took to the stage at the CD2 convention after her unanimous DFL endorsement by the delegates this afternoon. The time for change has come…Coleen Rowley…Agent for Change and our next CD2 Congresswomen! I'll give more specifics in the next day or two. But before then (1) Check out her new website done by Bill Hillsman. It's a winner! 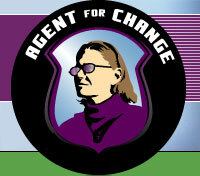 http://www.coleenrowley.com/ and (2) While you're there become a card carrying 'Agent for Change' and 'give'.